What do you do with your chili? The weather in most of the nation is still too cold to drag out the grill so let's do some things with chili. We've done several articles on composing a great pot of Texas chili. Now it's time to put that chili to a use other than just eating it plain. We start with the chili simmering on the stove. The chili should be just a little soupy because we need some juice for gravy. With a pair of tongs, dip each tortilla in the chili until it becomes limp. Lay the tortilla out flat and put about three tablespoons of the cheddar cheese down the middle. Add about a tablespoon of the chopped onion. Roll the tortilla into a compact roll. Place a thin layer of chili in the bottom of the baking dish. Place each enchilada with the seam side down in the dish so it won't unroll. Do this until you have the dish covered with enchiladas. Put on a thin layer of chili meat (use a slotted spoon to get more meat than gravy). Top the layer of chili with thin layers of cheese and onion. Repeat the layer. When your dish is full, top with more chili, cheese and onions. Stick it in 350F degree oven until it's all bubbly and the cheese on top is sorta browned. Serve with traditional refried beans, rice and guacamole salad. You will want some saltines and/or warm tortillas also. And don't forget the ice tea. Mix the first six ingredients. Add one-third of the grated cheese and one-third of the chopped onion to the batter. Combine well. Spread half the batter in the bottom of a 9x13-inch baking pan. Put a layer of chili on top the batter. Top that with one-third of the cheese and one-third of the onion. Pour on the remaining batter and top with the remaining cheese and onion. Bake at 350F degrees for about 45 minutes. This is a full meal deal, all that's needed to accompany is a green salad. My favorite Tex-Mex item is the burrito. A burrito is like a plate lunch wrapped in a tortilla. We start by warming the refried beans so they are spreadable. Warm the tortillas (best way is to put them on a damp paper towel in a covered microwave-safe bowl and zap them for about a minute. They need to be limp so you can roll them. Place a tortilla flat on your work surface. Spread the bottom half of it with a layer of the refried beans -- a little over 1/8 eight inch thick should do it. Next, place some fairly dry chili on the lower third of the tortilla on top of the refried beans. Add some cheese and chopped onion. Here's the tricky part. You fold the bottom third of the tortilla with the stuffing over, away from you, then the sides are folded toward the center and the top pulled down to form an envelope. Got that? Wish we had video. Place the burrito with the flap down in the baking dish. A couple of tries and you'll get down the amount of stuffing and the folding technique. 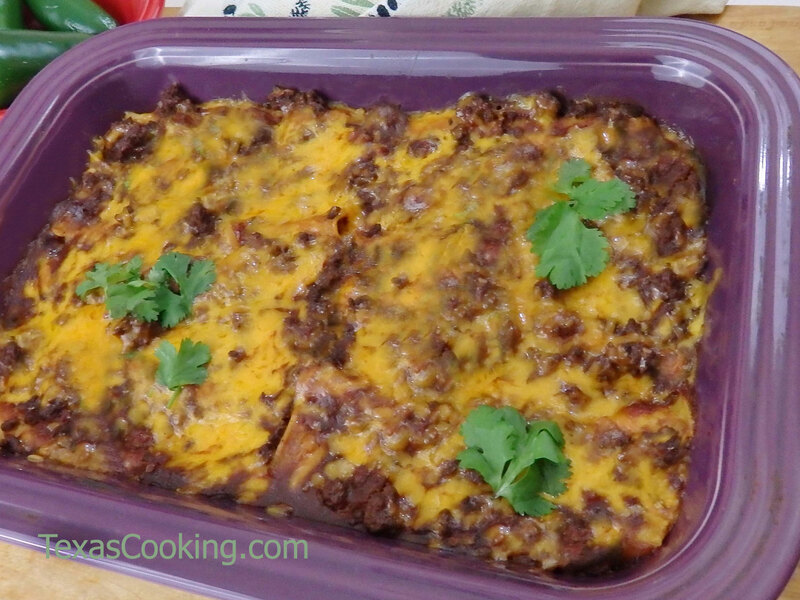 As with the enchiladas, cover with chili and top with cheese and onion. Bake at 350F degrees until all bubbly. One burrito makes one serving for an ordinary person. Here's another of your favorites, and I know it's one of mine, too. The restaurants serve their taco salads in dishes made from fried tortillas. If you don't have access to equipment for making the tortilla dishes, just use a plain bowl. I prefer the bowl. Put a serving of your chili in the bottom of your serving bowl. Put several tablespoons of the cheese on top of it. Top that with a handful of shredded lettuce, some chopped tomato, a little more cheese and some onion. Garnish with bell pepper ring and a couple of hamburger dill pickle slices. Trust me on this. Serve with saltines or corn chips. Mmm, mmm good. The combination of hot and cold, crunchy and tender is just heavenly. Anything homemade is better than store-bought any day. Take time to make some taco chips to go with your Tex-Mex. Cut corn tortillas (yellow taste better) into quarters. Separate the pieces. Fry in a half-inch of hot oil until golden brown. Drain on paper towel and keep warm until serving time. If your doctor allows, sprinkle on a little salt. If you should decide you need a little dessert after your Tex-Mex feast, there are only two real options, (1) a small dish of pineapple sherbet, or (2) a pecan praline. If any Tex-Mex place offers you anything else, it needs to be investigated by the CIA, Chili Investigation Association.